'"Across the Board' is a semi-autobiographical project inspired by the urge to bring carved representations of my ancestors and my partner’s ancestors to a chessboard, which is a metaphor for the post-colonial relationship in New Zealand between Maori and Pakeha, or pale skinned people. The outcome will be a non-fiction narrative driven, not just by historical and theoretical research, but by the practice based investigations of a twenty-first-century carving studio. I began working on this project in 2009, when I started to research and carve a chess set inspired by the Lewis chessmen. Susan Stewart’s book On Longing (1993) provided me with some thought provoking ideas around the notions of nostalgia and the souvenir, which established the beginning of a theoretical context for my work ..."
OXFORD UNIVERSITY, ENGLAND (2013) ‘Across the Board’ - a project exploring diaspora and migration’, Rethinking Diaspora Conference, St Anne's College, Oxford University, Oxford, England, 30 June - 2 July 2013. BRIGHTON, ENGLAND, (2013) ‘Across the Board: A Project Exploring Identity and Diaspora’, ECAH: The European Conference on Arts & Humanities, Brighton, England, 18-21 July 2013. NIJMEGEN, NETHERLANDS (2013) ‘Voyages Across the Board: A Game of Post-Colonial Chess’, 19th Annual Conference, New Zealand Studies Association, Nijmegen, Netherlands, 26-29 June 2013. ST JOHN'S, NEWFOUNDLAND and LABRADOR (2011) ‘Synergies Between Two Great Seafaring Cultures: Maori and Viking. Department of Women's Studies Speakers' Series (Fall Semester 2011), Memorial University, St John's, Newfoundland and Labrador, 18 October 2011. WELLINGTON, NEW ZEALAND (2011) ‘Synergies of Materiality Between Maori and Viking’. Art Association of Australia and New Zealand 2011 Annual Conference. Wellington, New Zealand. 7-9 December 2011. 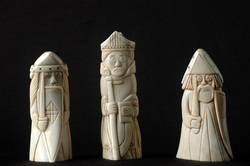 KALAMAZOO, MICHIGAN, USA (2010) ‘Lewis Chessmen ‘Pigmy Sprites’ of Tiny Time Travelers’. 45th International Congress on Medieval Studies. Kalamazoo, Michigan, USA, May 13-16 2010. AUCKLAND, NEW ZEALAND (2009) ‘Vikings of the Sunrise’. Cumulus Aotearoa Conference, Auckland, 9-10 November 2009. It explores notions of diasporic identity in New Zealand and considers the complexities of a post-colonial ‘self’ made up of a multiplicity of histories and heritages. It looks at the role of the object as a carrier of cultural memory, nostalgia, and longing, both theoretically through the writings and experiences of Susan Stewart and Edmund De Waal, and according to the Māori system of wairua or soul. It brings diverse ‘pieces’ of ancestry together in a post-colonial chess set and looks at the game of chess as a metaphor for the relationship between Maori and Pakeha. Through the process of carving, it uncovers and distills embedded meaning in the hierarchies, carving, costuming, adornment, sacred objects and cultural practices of Maori and Pakeha.